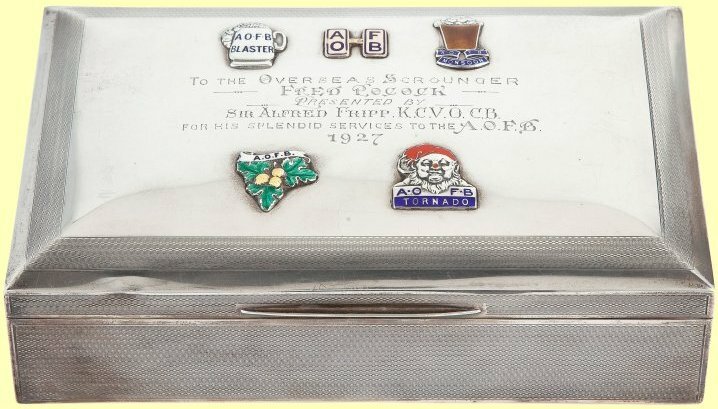 There were two types of cigarette case, plain silver cigarette case priced at 25/- for silver 8/- EPNS, and a 'Long Thin' cigarette case priced at 45/- for silver and 15/- EPNS, both cases came with soldered cufflinks and badges of rank could be added at extra cost. 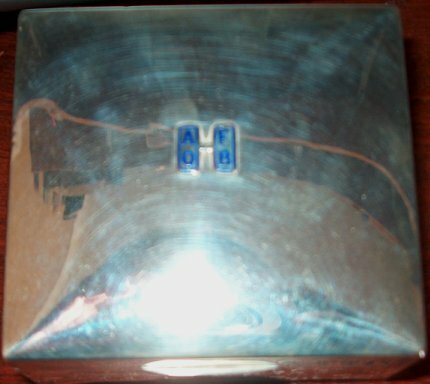 A.O.F.B. cigarette boxes were cedar lined and came in four different sizes depending on the quantity of cigarettes they would hold. 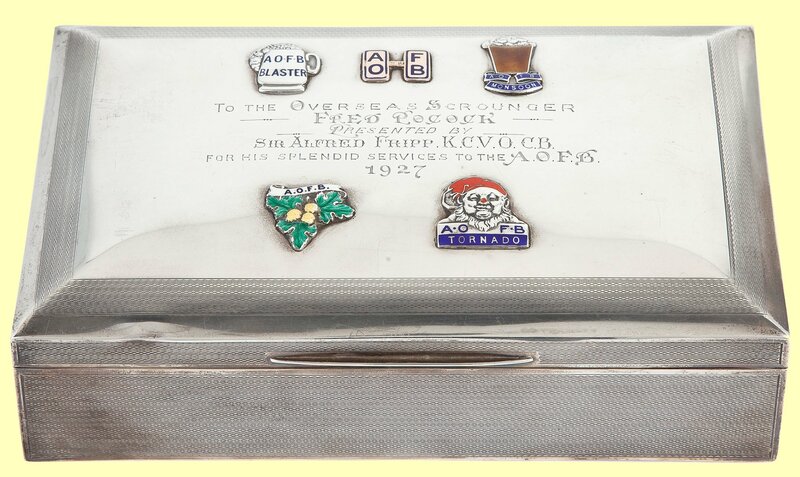 There was a 25 capacity box ( silver 18 shillings , EPNS 9 shillings ), a 50 capacity box ( silver £1 13 shillings , EPNS 15 shillings ), a 75 capacity box ( silver £1 17 shillings 6d, EPNS 18 shillings ) and a 100 capacity box ( silver £2 10 shillings , EPNS £1 2 shillings 6d ). Cigarette/Cigar Box of Frederick Gavin Elliot Pocock - The Grand Overseas Scrounger. 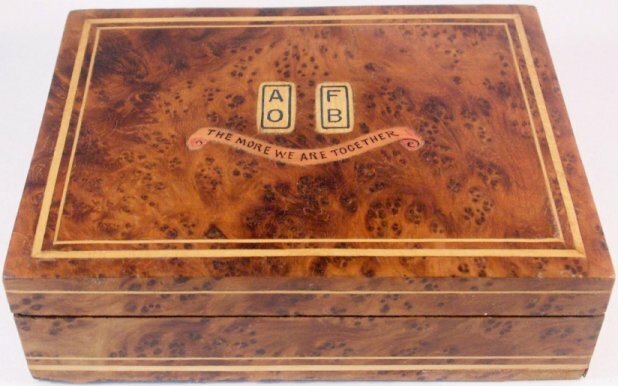 The box was part of the Malcolm S Forbes ( Forbes magazine ) Collection and went under the hammer 1st June 2011.
scroll ' The More We Are Together' . The box holds up to 50 'gaspers'. Picture and information on its' original owner courtesy of David Landon. 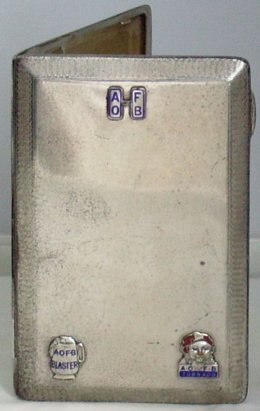 David Landon informs that the cigarette case shown belonged to his Grandfather, Harold Ernest Evans. Harold served in the Royal Navy during the Great War ( First World War ) and was quite a prolific sportsman, excelling at tennis, golf ( played off scratch ) and was a first class cricketer, who may well have played for England had the War and his naval service 'not got in the way'. He was also believed to have been appointed Fleet Sports and Recreation Officer due to his sporting prowess. Harold was also one of the first men to win the O.B.E for gallantry (when H M S Argyll was sunk) and known to be a teetotaller.